The Centre for Teaching Thinking (CTT) is established in 2014 as a consequence of the expansion of the roles and functions of the Centre For Philosophical Inquiry in Education (CPIE) which was founded in January 2006. Upon expansion, the CTT now consists of three major units, namely, (1) Hikmah Pedagogy for Inquiry & Critical Thinking; (2) Creative Thinking; and (3) Thinking-based Learning. The CTT is located on the 4th Floor of the Kulliyyah of Education Building, IIUM. 5.To develop ethical understanding, deliberate over moral issues and to find meaning in experience. ADNI Islamic School: 12th – 13th April 2008; 2013; 2014. 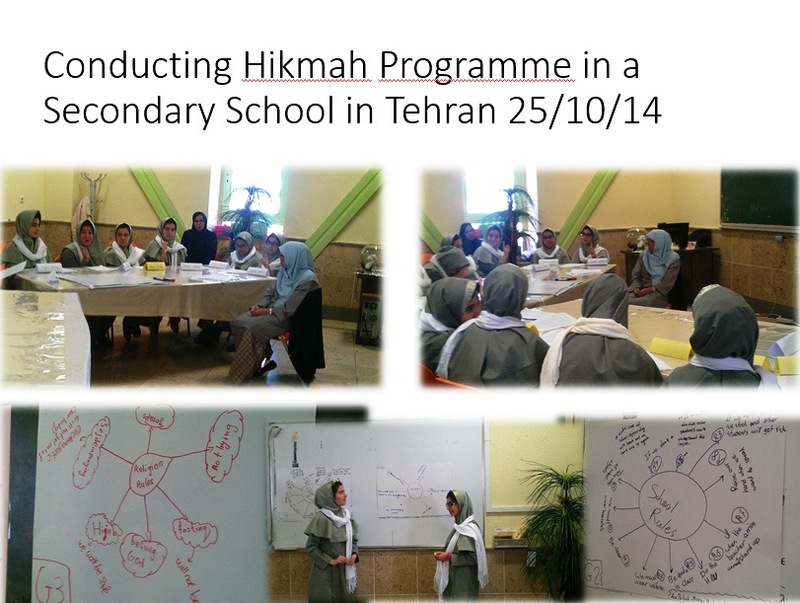 A session on Hikmah Pedagogy for Higher Order Thinking and Meaning. 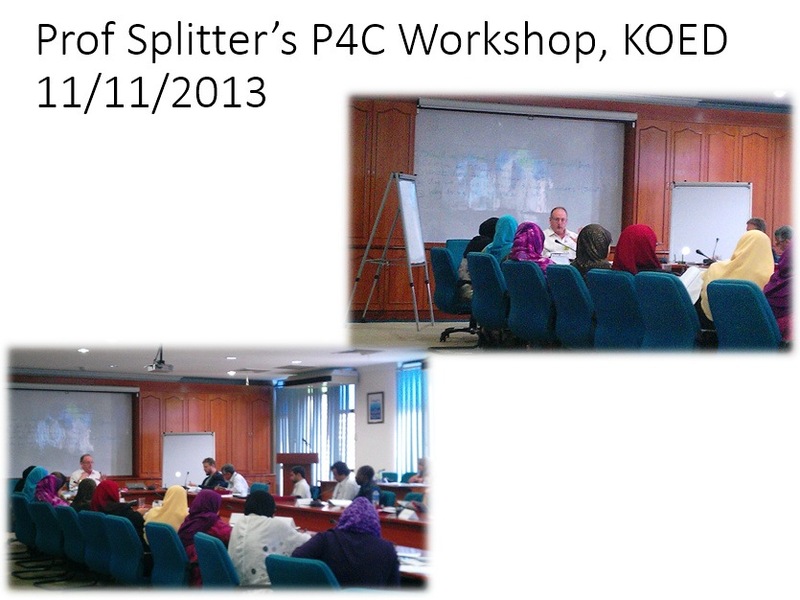 Kulliyah of Education Staff Development Programme, 19th August 2014. Maahad Tahfiz Sains Fatimah Az-Zahrah, Gombak : 7-9 January 2015. 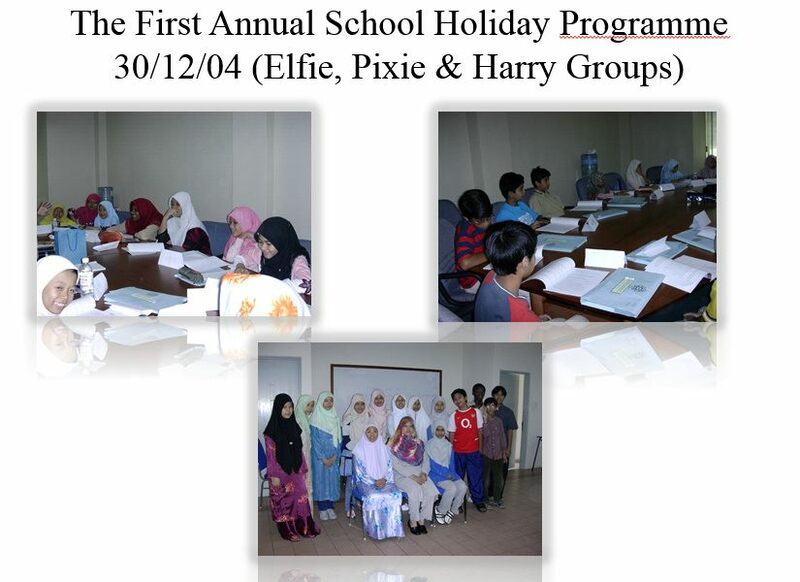 IIUM SLEU Hikmah Programme (for weak students): 15-16th January 2008 and 1 semester of practical session. Experimental Programme in Sek Ren Puteri Seremban, Sek Ren Islam Al-Huda, Gombak, Sek Keb Pulau Sebang, Melaka, and Sek Ren Tunku Besar, Tampin 2002-2003. 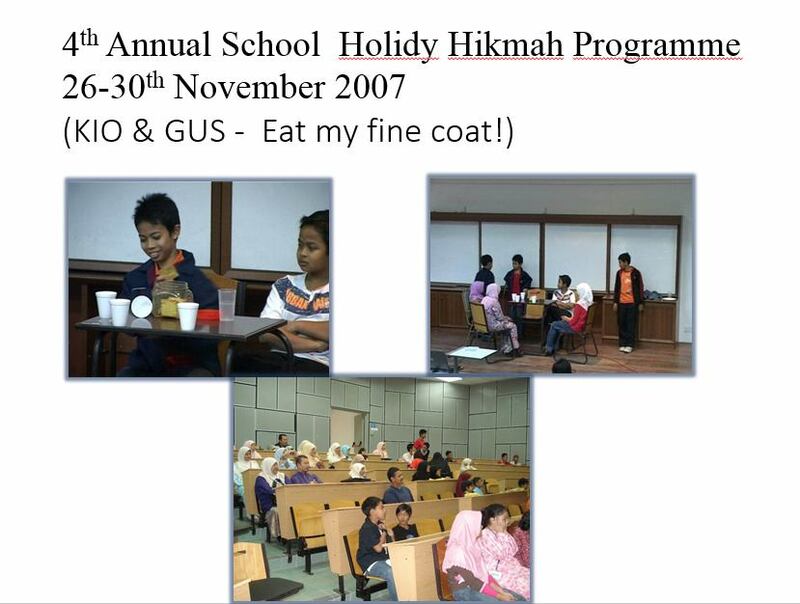 Held annually during the long school holidays from 2003 until today. Juhasni Adila Juperi who won Best Thesis Award 2011 (Social Science and Humanities category) from Nurul Yaqeen Foundation for the thesis entitled “Philosophical Inquiry in Islamic Education and Its Effect in the Development of Questioning Skills Among Secondary School Students”, 16 April 2012. Juhasni Adila Juperi who has been awarded with the Tunku Abdull Rahman Graduate Student Bursary 2012 from St. Catherine’s College to pursue an MPhil degree in Education at the University of Cambridge, United Kingdom. Write up on CPIE in the Philosophy: a School of Freedom (UNESCO, 2007) p. 41-42. Rosnani Hashim (2013). Pedagogi Hikmah dan Pengajaran Kemahiran Berfikir di Sekolah. 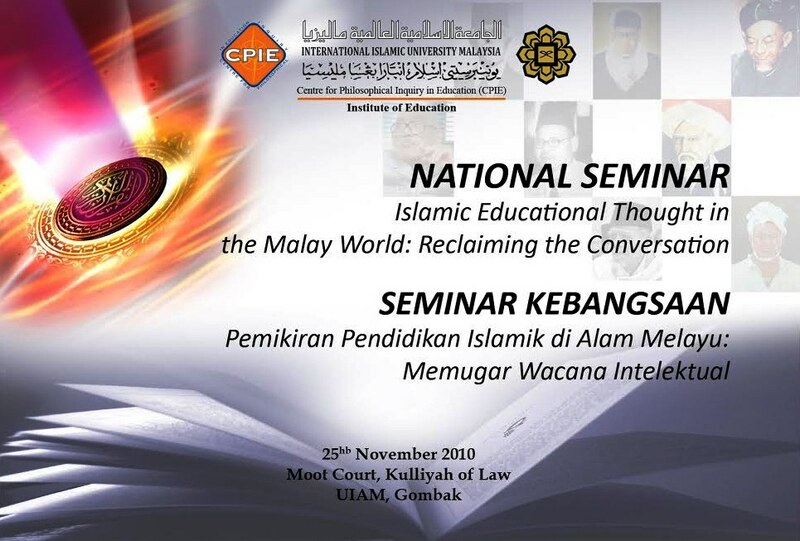 Kuala Lumpur: CPIE, IIUM. Rosnani Hashim (2014) Mira Thinking Series for Muslim Children 2d Ed , Kuala Lumpur: Saba Islamic Media. This book is complete with its manual for teachers. Rosnani Hashim (2012) Sarah – The Budding Thinker. ISBN 978-967-10986-0-8. Kuala Lumpur: Centre for Philosophical Inquiry in Education. Rosnani Hashim (2004) Siti. Translation of Lipman’s Pixie. CPIE. Rosnani Hashim (2004) Alfiyah. Translation of Lipman’s Elfie. CPIE. A Set of Thinking or Conceptual Games. Rosnani Hashim (2010). Reclaiming the Conversation: Islamic Intellectual Tradition in the Malay Archipelago. Kuala Lumpur: The Other Press. Rosnani Hashim (2011). Reviving the pedagogy of philosophical inquiry among Muslim teachers and students in Yedullah Kazmi, New intellectual horizon in Education, pp 1-20. Kuala Lumpur: IIUM Press. 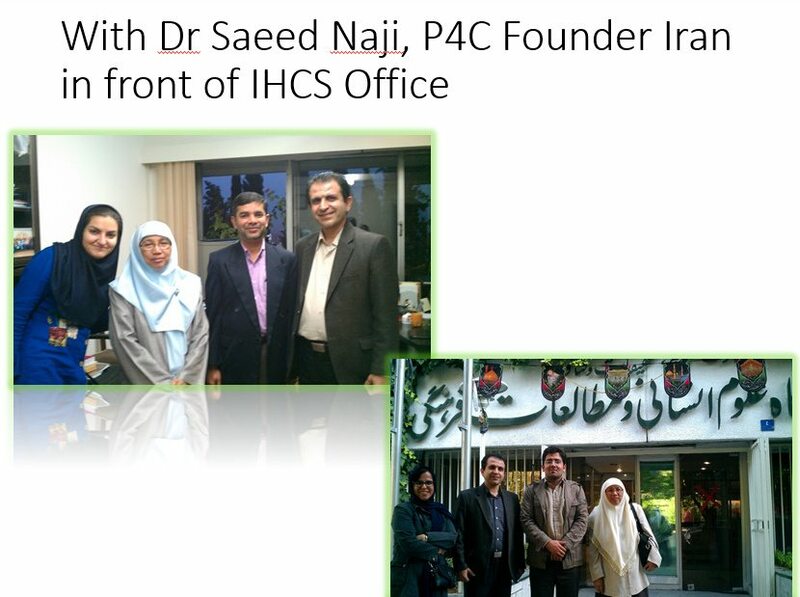 R. Hashim, Suhailah H., & J. Adila Juperi (2014). 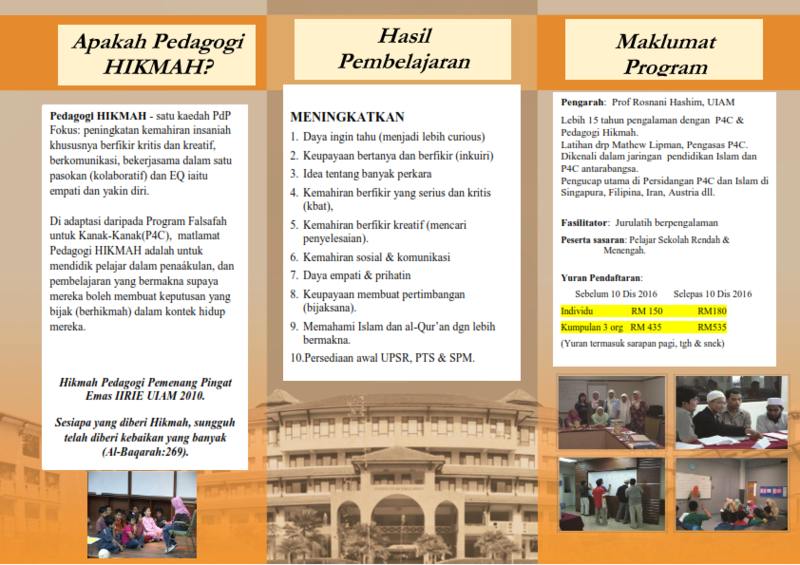 The Hikmah (Wisdom) Program: A philosophical inquiry for the teaching of Islamic Education in Malaysia. In Sa’eda B. & P. Ghim-Kian Chew (Eds.). Muslim Education in the 21stCentury: Asian Perspectives. London: Routledge. Suhailah Hussien (2011) (Ed.). Selected Readings in Educational Foundations: Ummatic Ramifications. ISBN 978-967-418-124-6. Kuala Lumpur: IIUM Press, International Islamic University Malaysia. Yedullah Kazmi (2011) Selected Readings in Islamic Critical Pedagogy, two volumes. Kuala Lumpur: IIUM Press. Rosnani Hashim. (2009). Philosophy in the Islamic tradition: Implications for the Philosophy for Children Program (P4C). In E. Marsal, T. Dobashi and B. Weber (eds. ), Children philosophize worldwide: Theoretical and practical concepts. Germany: Peter Lang. Rosnani Hashim(2011). Developing capacities for critical thinking and philosophical reasoning in schools. In S.O. Imbo, A. Baharuddin & S. Saifuddeen S.M. Salleh (Ed.) The role of universities in promoting dialogue through philosophy (Kuala Lumpur: Centre for Civilizational Dialogue, University Malaya), 11-22. Rosnani Hashim (2002, August), “Investigation on the Teaching of Critical and Creative Thinking in Malaysia,” Jurnal Pendidikan Islam, Vol 10:1, pp. 39-56. Rosnani Hashim (2005, March), “Kemahiran berfikir, hikmah dan keperluan program falsafah di sekolah [Critical Thinking in School, Wisdom and the Need for Teaching Philosophy]”, Jurnal Pendidikan Islam, Vol 11:2 pp. 46-68. Rosnani H.,Suhailah H., &Imran, A. (2014) Ḥikmah (wisdom) pedagogy and students’ thinking and reasoning abilities. Intellectual Discourse, 22:2 (2014) 119-138. Rosnani Hashim (2004). 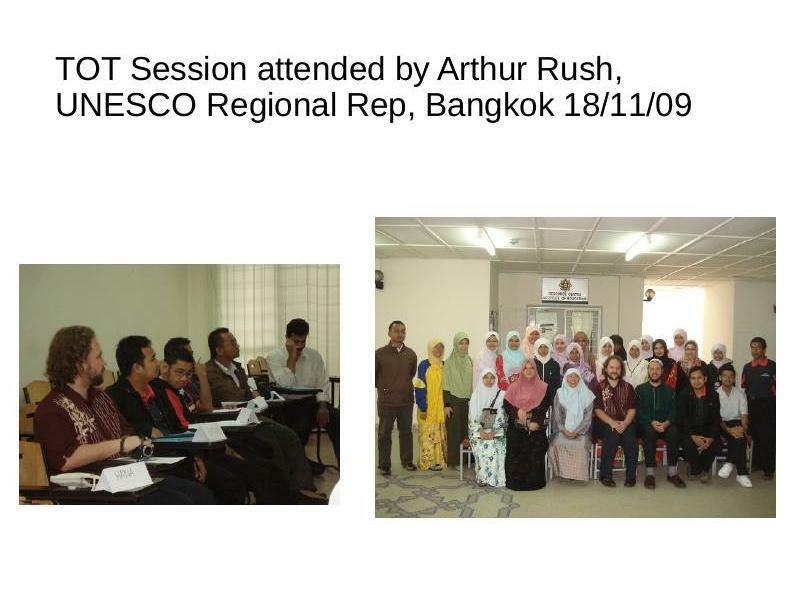 Rosnani replicated the same study (2003) but between high and average ability groups of Grade 6 students in Tunku Besar Primary school in Tampin, Negeri Sembilan. Both groups (12 years old students) were doing philosophy using English language for one hour every day for three weeks. Although both groups improved in their reasoning and language skills, it was only statistically significant for the high ability group. Moomala Othman (2005) PhD Dissertation. A comparative study was conducted between Reader Response and Philosophy for Children (P4C) approaches in teaching English Literature among Form Four students of Sekolah Menengah Sains (Science Secondary Residential School) in Ulu Yam, Selangor. The experimental study reported a significant mean difference in reading abilities for P4C group. There was a difference in means for thinking but not statistically significant. Probably the groups were already of high ability students good in scientific thinking. 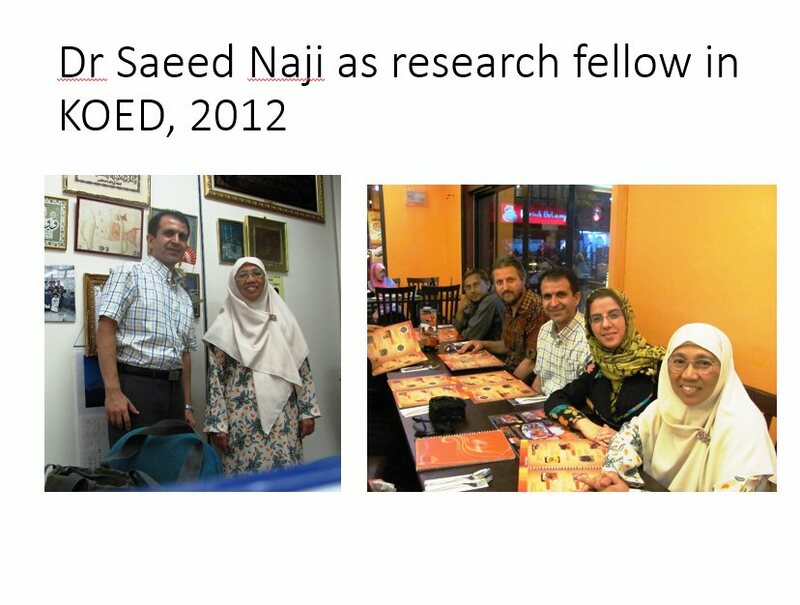 Norillah Abdullah (2009).PhD Dissertation. 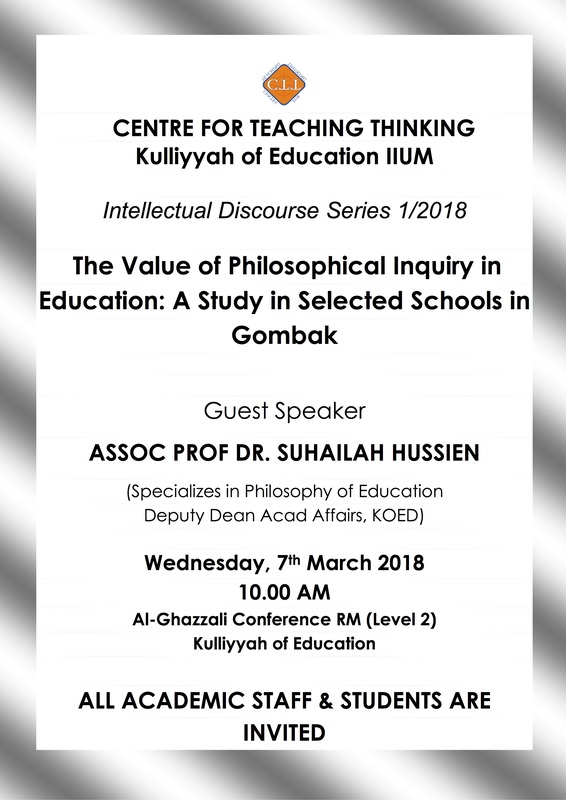 An experimental study was conducted to examine the effectiveness of the pedagogy of philosophical Inquiry (PI) in enhancing critical thinking and self-confidence among undergraduate students of the Kulliyah of Islamic Revealed Knowledge, IIUM. The result showed that critical thinking skills and self-confidence among the treatment group (using PI) improved significantly. Wan Mazwati Wan Yusoff (2010). PhD Dissertation. Reviving the Muslim minds through doing philosophy: Implications for curriculum of Muslim education. International Islamic University Malaysia. Wan argues for the necessity of reviving philosophical inquiry based on study of the Qur’an, Hadith and the Islamic legacy and its inclusion in Muslim educational curriculum. Abdul Shakour Preece (2011). PhD Dissertation. 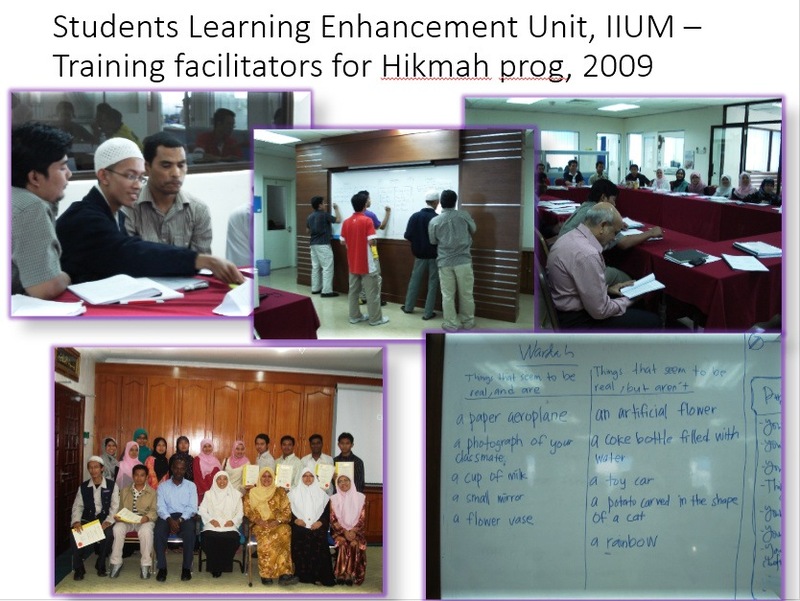 Developing ELT materials for Muslim learners (EMML): A Qualitative Study, International Islamic University Malaysia. 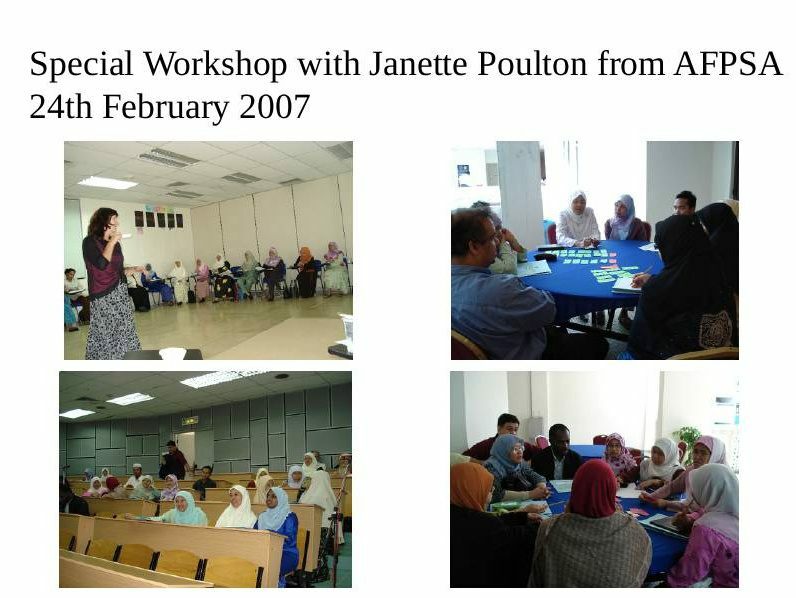 Abdul Shakour developed ELT materials based on the principles of Islamic values and Lipman’s criteria for a philosophical inquiry story and utilized it among CELPAD non-native English language learners. The method employed the the P4C’s Community of Inquiry. The study found that these materials were meaningful and motivating for learners, thereby enhancing their English language learning. Adila Juhasni Juperi(2011). M.Ed. Project.IIUM. Philosophical Inquiry in Islamic Education for Effective Questioning skills. This qualitative study was conducted in the residential science school in Jelebu, Negeri Sembilan. The results show that by applying the Community of Philosophical Inquiry approach, students’ level of questioning increased to more of higher order and also their quality of reasoning. Rosnani H.,Suhailah H., &Imran, A. (2014) Ḥikmah (wisdom) pedagogy and students’ thinking and reasoning abilities. Intellectual Discourse, 22:2 (2014) 119-138. 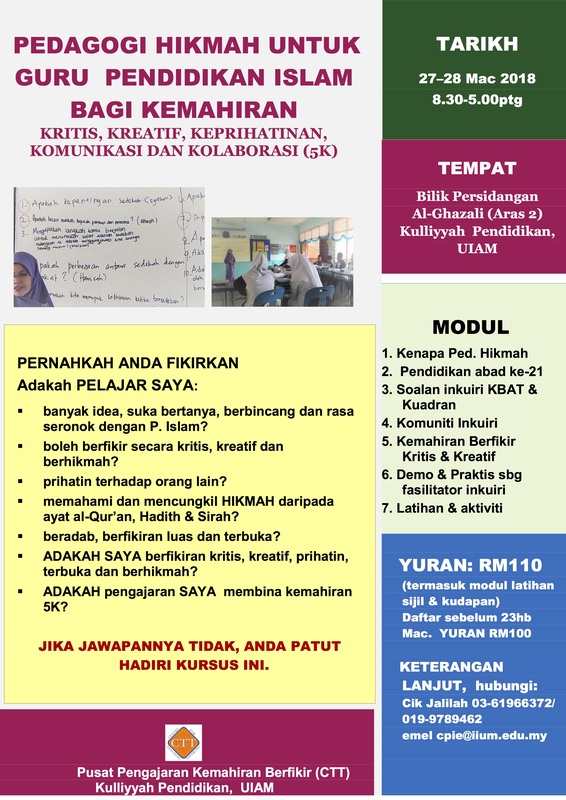 A self-perceived study using the survey method of 188 Grade 7 to 10 students of the International Islamic School Malaysia who studied using the Hikmah Programme of philosophical inquiry for one year. 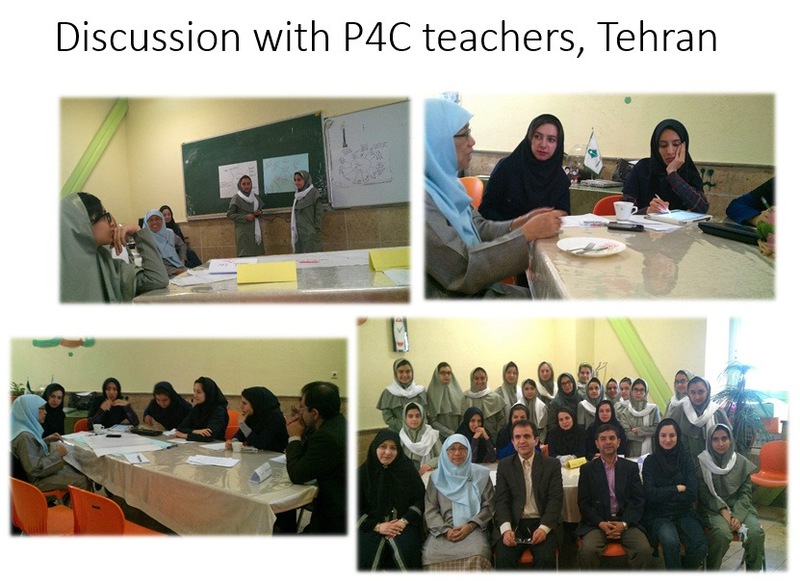 The findings were supportive of the positive influence of the pedagogy on students’ abilities to think and reason better after experiencing the programme. Furthermore, the participants demonstrated a considerable improvement in their cognitive and social-communicative skills, as evidenced in the scores obtained for the post-programme’s test. 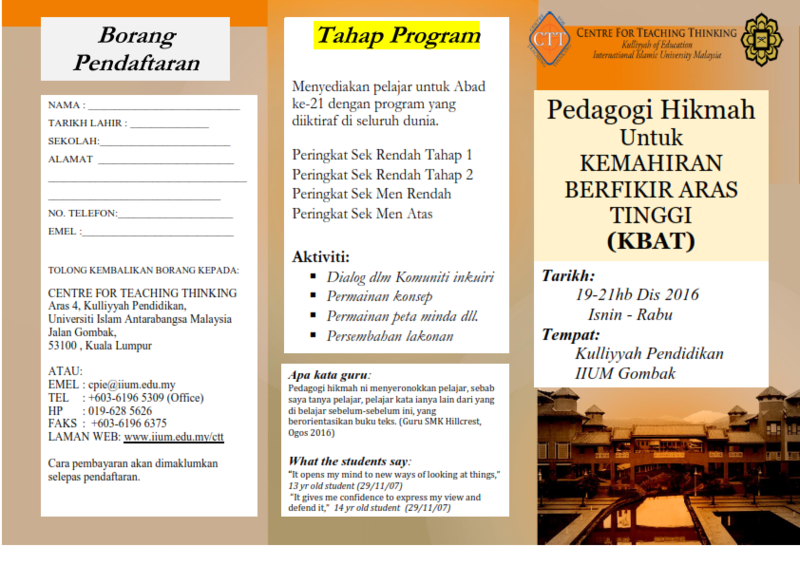 A Study on teaching Thinking Using Philosophical Inquiry in an E-Learning Environment at CFS, IIUM. 12. Moomala Othman Teaching of Thinking Completed in 2005 A comparative study was conducted between Reader Response and Philosophy for Children (P4C) approaches in teaching English Literature among Form Four students of Sekolah Menengah Sains (Science Secondary Residential School) in Ulu Yam, Selangor. "Philosophy for Children in the Malaysian Educational System - Reality or fantasy?". Dr. Abdul Shakour Duncan Preece at NAACI 2014 Conference on Philosophy for Children and Its Diverse Application, 25 to 27 June 2014 at Laval University, Quebec, Canada. “Make it Mean! Using a ‘Community of Inquiry’ To Improve Language Skills in the ESL Classroom.” Dr. Abdul Shakour Duncan Preece at Oxford Education Research Symposium at St Edmund Hall March 17-20, 2013, Oxford, UK.